These two unnamed Summits are located on the Tin Mines Trail, to the east of Mt Jergyle (VK2/RI-004). Having activated Mt Jergyle for the VK2 inauguration on 1st September, I decided that an expedition further along the Tin Mines Trail was in order. There are several Summits located close to the trail and inspection of the topographic map suggested that two of them, the unnamed Summits VK2/RI-010 and VK2/RI-009 would be quite easy to access without having to hike too far through the bush. So, on Sunday 6th October 2013, my lady and I once again loaded up the Hilux with radio gear and a picnic lunch and headed for the hills. We chose to access the Tin Mines Trail from the Tunnel Road end, and since that would mean passing Mt Jergyle on the way we decided we’d activate that Summit again on the way through. We got up to Norths Lookout without mishap, avoiding one or two of the obstructions we remembered from the previous trip, and had lunch there. A short SOTA activation put VK5LA, VK3PF, VK3AFW, VK3DET, VK3FB, VK3CAT, VK2JI/5, VK5HCF/P, VK1MA/2, VK3GHZ, VK3HRA/P, VK1DI, VK3JM, VK3AMB, VK1NAM/3, VK3FPSR, VK3YY, VK3AMX, VK2YW, VK5PAS/P, VK7FMPR, VK3BYD and VK3MRG/P in the SOTA log, and then we packed up and headed down the trail towards VK2/RI-010. Once again the Tin Mines Trail did not disappoint. Between the Tin Mines camping area and VK2/RI-010 we came across an immense bog hole filled with the deepest, slimiest mud we’d seen in a long time. Without a winch to pull the Hilux out if I bogged it, I wasn’t about to attempt to drive through that, so we hopped out and had a look around. Sure enough, someone had been there before us and had bush-bashed around the bog hole. We walked along in their wheel tracks, figured it was okay, and so I backed up, dropped the ute into low range and cautiously edged through. Back on the trail the GPS soon told us when we’d reached the closest point of approach to the VK2/RI-010 summit. As predicted, it was a short climb through relatively open bush to the summit, where the Barrett once again gave a good account of itself. VK3ATB/P, VK5HCF/P, VK1MA/2, VK3FPSR, VK2YW, VK3PF, VK3AMB, VK3CAT, VK3YAR, VK3UBY, VK2DAG and VK3LAC were soon in the SOTA log, all worked despite me hopping around like a madman swatting at the clouds of mosquitoes who had descended on me, delighted at the prospect of a free lunch. Since this was a first-time activation I am considering claiming the naming rights to this summit, dubbing it “Mount Mozzie” in honour of Australia’s most irritating insect. Defeated by the mozzies, but with a successful activation in the bag, we quickly packed up and fled. Back in the Hilux, the GPS once again counted down the distance to VK2/RI-009 and told us when we’d reached the closest point of approach. Cautiously I opened the door half an inch and stuck my nose out, expecting another cloud of mozzies to dive to the attack. Fortunately they weren’t in evidence, at least not in the numbers we’d experienced on the previous Summit, so we decided to give it a go. As before, the Barrett 940 and the dipole worked very well and we soon had VK3KAV/P, VK3PF, VK3GHZ, VK3CAT, VK3OHM, VK3JM, VK5BJE, VK3AFW/M, VK3XPT/P, VK3AZZ, VK3AMB, VK5WG, VK3BYD, VK2DAG, VK3FPSR, VK1NAM/3, VK2YW, VK3DET, VK5LY, VK2SS, VK3CCR/2, VK3TCX, VK3MNZ, VK3YY, VK3UP and VK1DI in the SOTA log. The afternoon was wearing on and daylight would be fading soon, so we had a quick cup of tea and then got back on the trail. 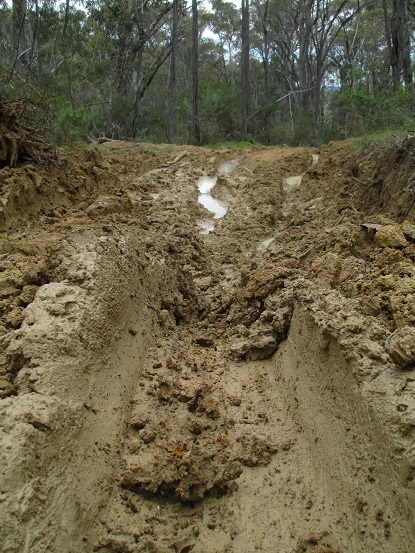 Apprehensive of more spectacular bog holes I drove slowly, but fortunately there were no more obstacles in our path. Approaching Tipperary, VK2/RI-002, I kept an eye open for access points to the summit as I knew that John, VK2YW, was intending to activate that Summit the following day. I made a few notes for him and emailed them to him when I got home. This is the 3rd one I have read Andrew – love it! keep it up. I agree with Aeroguard comment and can 2nd your comment about leaving a waypoint for the vehicle. I found the little Etrex 10 an absolute gem for this stuff. Will re-read your notes when I go to do some more down in that park. Nice to see you in the WordPress world. Many thanks for the S2S contact whilst I was on the top of VK5/ SE-016 on the Fleurieu Peninsula, as part of the 12 month anniversary of SOTA in VK5. Here’s hoping we have many more.